Not all remixes make sense, but there's something fitting about British dub-reggae and post-punk producer Dennis Bovell reworking tracks by Glaswegian misfits Golden Teacher. 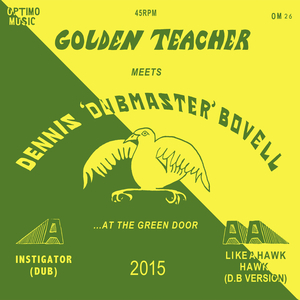 Put together by Bovell at Glasgow's infamous Green Door Studio on a day off from touring, these dub revisions take the hard-to-pigeonhole six-piece's adventurous productions and add an extra layer of spaced-out goodness. While Bovell has provided some overdubs - mostly dub organ stabs - for the most part he's just made everything extra-dubby, extra-freaky and altogether weightier. The results are, predictably, mesmerizing, turning "Like a Hawk" and the previously unreleased "Instigator" into dancefloor dub masterpieces.